Meenakshi believes she is not someone who will follow a path because everyone is following it but she believes in carving her own path. She has been passionate about journalism since her school days, however under family pressure she graduated in commerce. But her true calling was something else, so rather than going for CA, CS, CWA or MBA career she took further studies in Journalism. I am a complete package in terms of news sense, journalistic approach & pleasant personality with positive attitude. I have a fresh face & style which surely will prove refreshing on screen. I have worked on output desk which makes me sound enough to handle the technical aspects of working in news channel. Besides that my purpose of becoming an anchor is not limited to the idea of being on screen only. But I love journalism, I have a deep interest in news & to be precise, presenting news to a country of 110 crore people is not only amazing but challenging and responsible job, which I have the tenacity and capacity to perform. 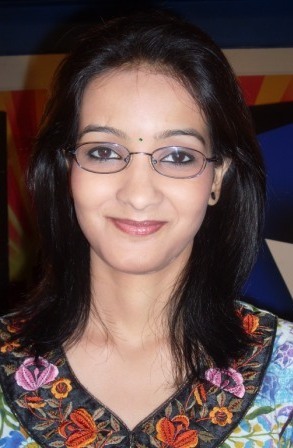 Meenakshi Kandwal has started her new innings as News Anchor on Star News. Starting 4th August 2010, She has become news anchor on Star News. Here is first video of Meenakshi presenting news professionally on national television. I would like to see you soon live on some National News Channel, if not on star. wish u all the best.Show the world tht pahari girls are the best.to addto it the Kandwals………haha. gud 2 c ma cousin on TV …. u r goin 2 rock …..
darna mat sara rajasthan tumhare saath hai…..
Good wishes to dear Meenakshi…. wish u all the best ,you are best and you can do it welll..
Hey Meenakshi, You will surely make it. You have that capability and you deserve to be there. wish u all the best……..
wish u all the best……. Hi Meenakshi, best of luck. Keep Rocking!!!!!!!!!!!!!!!!!!!! wish you best of luck………………………. meenakshi. go do ur ur best. next world of success is waiting for you. garb this opportunity. all the best minakshi for ur & our dreamfull misson.jao or apne uttaranchal ka naam roshan karo. god bless u. Just do what you want..
Don’t worry about the results. You are going to win this contest sure shot. So cheers & Keep enjoying!! I would like to make you a winner at my level. Here i started campaigning for you dear.OK– Wish you a very Best of Luck,see you. Good that after I initiated the wishes and you are flooded with lot of them from all corners. Good luck………… don’t get fumbled at any point. You’ll rock. wish you all the best…………………..
keep your cool and presence of mind with a good mixture of humour in it. WIsh you all the best. I hope you will give 100% and achieve your goal definetly. i am om prakash gaur from I pray to god ur win best star anchor hunt.wish u all the best ,you are best and you can do it welll..
All the best Meenu ! But CA, CS, CWA or MBA are not bad at all, doing these degree people still on top. ol d best.. we want 2 see u a winner of star anchor hunt. plz do well. and chak de fatte. Hey meena… Happyly take all challenges and move ahead. Our blessing are with u…. God Bless You. My comments need moderation. I am unable to understand it. Wish you all luck. Hi there !! I’m guddu’s friend. I pray for ur success… so be focussed, hav trust in yourself n see that u are gonna make it. u ve made it ……..
abhi party kaunse 5 star me hai ……………. HI MEENAKSHI, HOW R U. ALL THE BEST FOR YOUE SUCCESS. GOD BLESS YOU. I heartily congratulate you for the success achieved by you and i pray and believe that you will definitely reach at the top of your mission. Congrats Didi….!! I’m Saurabh Kandwal 4rm Chandigarh and i’ve sended u a request in facebook… so plzz add me…!! I was watching the grand finale. Superb Show by Meenakshi. I am just guessing. She must be somewhere Uttarahkand as her title seems to be from there. Even i saw during the she was reporting about Nainital during one round. I impressed wth you…you hav a gr8 talent. Hey would you like to marry me. hi Minakshi…….i just love ur attitude……. Congratulation meenakshi. you are the best anker. All the best foryour carrier. Best of luck for your carrier. congratulation meenakshi, you are the best anker. Thank u so much for your love & support..